So Unwrapped the goodies from this months kit from Scarlet Lime by " Christy Tomlinson" What fun again to just play with some different products, made a cute little scene on 10 x 10 canvas a banner in the sky over your spring garden, glitter, paper flowers...very easy and cute check it out! This is How mine turned out! I'm looking forward to next months kit already! Have a great day doing something you love and do something nice for someone else too! Enjoy the rest of your Week......on to March!! Huge snowflakes falling, Saturday errands,lunch with the Family,making a mess on the table! I decided to make some pages for a journal with the index cards from the thrift store we got last week. I really have to use all this stuff I keep finding its piling up. covered a few sides of the index cards with sb paper, gessoed on a few too so I could add some water color later.Happy Saturday! Playing at the table and having a messy Monday with miss girly! Loved this when I was little, when I came across this it brought back so many memories. So after having a little lunch with my hubby we decided to hit the thrift store to look around and I came across this folder full of papers for 1.99 and to my surprise I loved everything in it, I could only see a little in the wrapped up stapled bag, but this is what was inside. It looks like I could do something fun with this as backgrounds or something unique. Going to make a journal with the index cards and well that was my fun find today! Any suggestions leave me a note would love to hear your ideas! OK so after going to the Bookstore ( another favorite indulgence) I came across the book "Collage Couture" by Julie Netting. Wow, I couldn't wait to get it home and see something new. After getting some paper out and playing with new contours for body, face,eyes,hair and dress styles... I started feeling a bit more confident in drawing proportionately..so I left a few examples of what I drew. I have never been a good drawer at all. I need lots of practice. Also a few more things I made last week. Looking forward to reading Somerset Studio today. I'm totally a magazine junkie. Started She Art class 2 had a little time last night to check out some of the tutorials and looking forward to getting messy on Monday..took day off..cant wait! Collage Couture by "Julie Netting" love it! She art 2 class! oh ya! Just started a visual journaling class that required taping together magazine pages, then gessoing each page and folding according style. So this has two sides. I sewed the seems too. So we will see how this turns out. Ive never done this so I'm excited to see the finished journal. So here are some pics of front and back. One side I just doodled all over, other side I painted, stamped, added a little texture with music paper. Mother & Daughters music to my ear's! 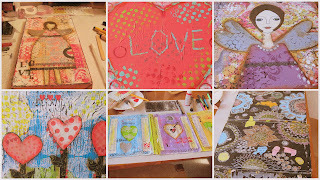 Hanging with my girls,playing with canvas,paints,paper,stamps..what a fun afternoon together. I think this is my favorite She girl so far. My favorite indulgence at last! Ahhh its Friday at last! What a busy week for me. It seems that I had way to much on my plate this week but finally all is well and done! Just grabbed the newest "where women create" magazine getting all cozied up in bed with my laptop,tea,magazine, kiddo & dog who is snoring like a man right now..lol kinda funny. Seriously this is just what I needed to end a long week. I have to share my Wednesday night visual journaling class, it was really fun to go & to be excited to try to do something different. Seeing people excited about creating something and getting into it was a lot of fun. It was a pretty good size group of women and seemed as if they all pretty much had been getting together for awhile but I enjoyed the conversation, the creativity and just playing for a few hours! 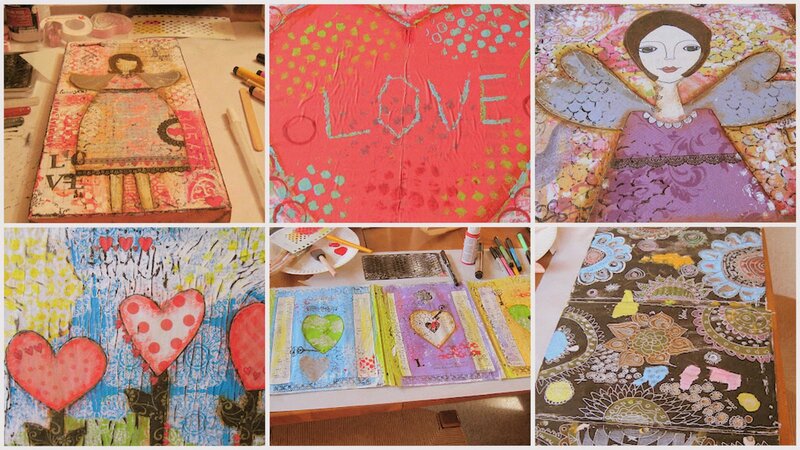 Looking forward to the mixed media class next Wednesday night! Have a great Friday...make something and wrap it up pretty and leave it on a neighbors porch with a note that says Have a great day! some of my favorites at CHA! cute!